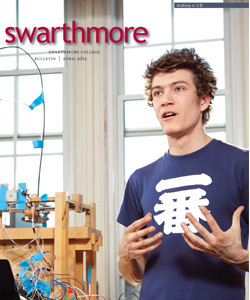 In late March, the College launched a dynamic new website (www.swarthmore.edu). Larger and more dramatic visual imagery and improved site navigation are among the ways in which the new site eclipses the former one, which had been in place for six years. The site was also developed with attentiveness to compliance with the Americans with Disabilities Act. Motivated by the explosive increase in multimedia and social media on the Web as well as revolutionary changes in the use of handheld and tablet devices, the website update represents the first phase of a more extensive redesign project. 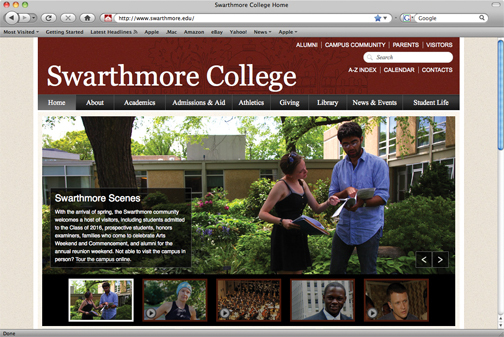 It includes a reorganization of the homepage and primary subsites, in particular the About, Academics, Admissions and Aid, Giving, News and Events, and Student Life pages; an A–Z index; the Alumni, Parents, and Visitors dashboards; and Spanish have all been redesigned. With a contemporary graphic design and content developed during the last 18 months by the in-house Web staff, the new site incorporates visual elements and multimedia that reflect the campus’s energy. Future changes include additional, redesigned academic and administrative sites as well as enhanced viewing for mobile phone and tablet devices.